Our "old timers" Thurmont events are always special. There's nothing like seeing old friends with so much in common! But meeting NEW friends who share so many interests and experiences is very special too. together, but introducing us to NEW friends we haven't met yet. James O'Neal is one of those. Take a look at the pictures he sent of his hobby: "decorating" his vacation house. "The Collins transmitter was a real bear to relocate. It came from WFAX in Falls Church, weighed 1,300 pounds and had to be completely disassembled for the 50 mile move. Afterwards, I spent more than a few weekends in cleaning it up, checking all components and reassembling it. (The plan is to convert it for use in the 160 meter ham band, but I'm not quite there yet.)" 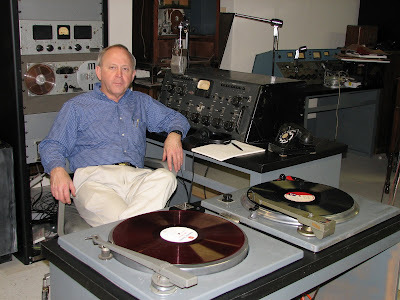 " That's an operational Collins 212-B seven-pot console that's just about as old as I am (1947 vintage). Ditto the RCA 74 microphone. You'll also notice that I was able to locate a telephone appropriate to the period. Since the photo was taken, I've found time to put up a wall (with double-glazed window, of course) to separate the CR from the "studio " space. If you look carefully into the "studio" you'll notice a slightly more modern RCA BC-7 solid-state console from the 1960s. Once we're in the house full time, I'll be able to better organize my collection--the pre-war TV is here in Franconia, but my 1954 RCA first production-model color set is out in the country, etc. " James is currently in his second career, after retiring as chief engineer for the former USIAWorldnet international television service. He is technology editor for TV Technology magazine, sister to Radio World. 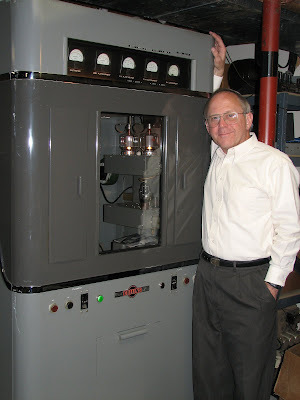 He has written and published a number of articles on the history of radio and TV and is currently preparing a piece on the unusual 1952 mounting arrangement of the WTOP-FM antenna at the Broadcast House facility. I sent him an invitation to join us in Thurmont this year, and he accepted!